The artist Tatjana Gmeiner is playing classic piano and is interpreting songs for here public with here beautifull 4 octave sopran.Tatjana started her music life at the age of 6 and she got over many years the classic russian music education. She finished the Music Academy with the music art diploma. 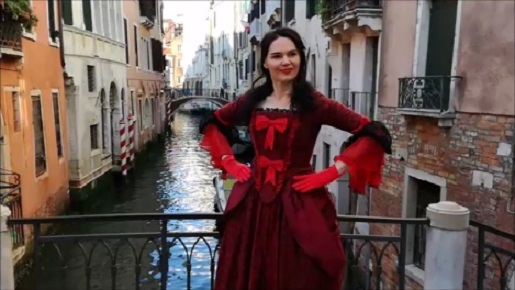 Tatjana is performing in here live concerts a SOLO PERFORMANCE in Italian, German, French, Russian playing and singing a multifaceted repertoire from italian canzone , Arie from Opera to russian classic and songs from operette. Tatjana as solist accompanies here beautifull 4 octave sopran voice with an excellent piano playing. BOOK this event BUILDING BRIDGES for your location and your exclusive public. BUCHEN Sie diesen Event BUILDING BRIDGES für Ihre Location und ihr Publikum. The actual album from the artist Tatjana Gmeiner is available to order at vasita.eu showing her playing piano and singing live in fantastic Music Video. She realized a cooperation in 2017 with the famous artist Nikolai GNATYUK in the song CHI JA PRIDU. All music videos are recorded under her license and permission. Tatjana is dedicating her art for the audience to "building bridges" and to be unique, be creative, be different.